You can pick up M3 and all the great indie books we've put out here or at VicesPress.com. All books are signed and can be personalized if requested. Winner of the "Best Comic Book" award at the 2012 Burbank International Film festival, the premiere issue of this series introduces us to the assassin, M3, and the FBI agent tracking her. Written by Erica Schultz and penciled, inked and colored by co-creator and legendary artist Vicente Alcázar. Agent Morris is on M3's trail, bringing in extra help from the Bureau to gather all the intel he can on her. Meanwhile, M3 has another target to hit, and a man from Machiavella's past comes back to haunt her. Cover art by comic legend Bill Sienkiewicz (Elektra: Assassin, Moon Knight). Agent Morris' past converges with the woman he calls, "M3," shedding some more light on his obsessions with her. And a dangerous new assignment in Chicago may be the last one for our woman with the scar. Cover art by Andrée Maitland. Barely escaping with her life, Machiavella revisits her childhood after her parents' murder, and her past becomes clearer. Also, the strings that are pulling M3 along her path are more visible, and are in danger of being cut. Cover art by Erica Schultz. Desperate for an ally, M3 goes to the most unlikely of people: Morris. Will he be able to put their pasts aside and help? And we gain insight into the events that led Machiavella on to the path of an assassin. Cover art by Chris Notarile TD and Chris R. Notarile (The Protector). Not knowing who to trust, Machiavella bets it all on Agent Morris, the man who’s been tracking her since his father's death. Will he turn her in once he's used her to get to her handlers? This is the conclusion of the first story arc for M3. Cover art by Rick Buckler (Shadowflame). M3 is back and with a vengeance! Machiavella has returned from her trip to Belfast to begin her new life in Washington, DC. But as much as things change, they tend to stay the same. Cover art by Vicente Alcázar (Jonah Hex) and Moose Baumann (Green Lantern). Who is this mysterious new woman in Morris’ life, and who wants her dead? What does Vella find in Morris' apartment? M3 is back, and her story continues. With cover artwork by Nouri Zander (Bucktooth) and Jayel Draco (Pack, Tracy Queen). Maggie and Vella's pasts in Italy are revealed. Marco learns a dark secret about his father. Morris' loyalty to Vella is called into question. And a young man from Vella's past shows up, unannounced. Cover art by Scott Larson (Femforce). Vella's first assassination is revealed, and a past relationship comes back to haunt her. Maggie tries to learn more about her sister. Morris and Vella make an unlikely alliance with Vella's competition. Cover art by Scott Barnett (Dead Man’s Party). Seamus and Morris have words on their way to Rome to confront the Parlati family. Maggie meets Otto's mom. Someone is going to die. Cover art by Jay E. Fife (Scarlet Huntress) and Moose Baumann (Green Lantern). Morris, Seamus, and Vella deal with the aftermath of their mission to Italy, but not everyone is coming home. This is the final issue of the M3 series. A Trade Paperback collection of M3 issues 1 - 3. Limited Edition Cover art (500 copies) by Patch Zircher (Action Comics). A Trade Paperback collection of M3 issues 4 - 6. Cover art by Dave Acosta (Doc Savage). A Trade Paperback collection of M3 issues 7 - 9. Cover art by Adriana Melo (Doctor Who). 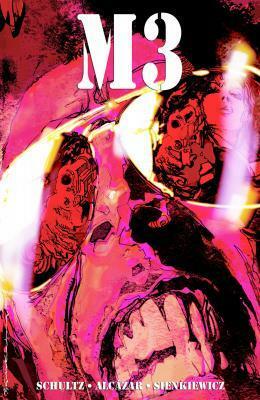 A Trade Paperback collection of M3 issues 10 - 12. Cover art by Ray-Anthony Height (Spider-Girl) and Jason Lewis (Thor: Asgard’s Avenger). Here's some other books you may want to pick up! Written by Erica Schultz, with art by Maria Laura Sanapo (DC’s Bombshells). Cover by Joe Corroney. Some alternate covers available (inquire when ordering). This trade paperback collects Charmed #1-#5 written by Erica Schultz, with interior art by Maria Laura Sanapo (DC’s Bombshells). Cover by Joe Corroney. Written by Erica Schultz & G. Willow Wilson, with art by Noah Salonga. Cover by Billy Tan. Written by Erica Schultz with art by Crizam. Cover by Joyce Chin. What happens if Winston Churchill found a time machine during World War 2? This comic takes you through the *historical **facts that show what really happened. Written by Erica Schultz with art by co-creator Claire Connelly (Black Eyes). Romeo and Juliet meets Animal Farm with a dash of The Twilight Zone in this off beat romance about a goat and a cow from rival dairy farms falling in love. Written by Erica Schultz with art by co-creator Claire Connelly (Black Eyes). Three issues in one! FBI Special Agent Callum Cooper has always tried to escape his past, but some mistakes…you can’t outrun. Now retired from a fatal diagnosis, an old foe returns to torture Callum in his last days. Unable to go it alone, Callum teams up with college student, Aisha Miller, hitting the road to catch the killer before more women become his victims. Dave Acosta (Pencils) and Andrew Covalt (Colors) bring this book to life from Action Lab Danger Zone. Cover artist: Kelly Williams, Interior cover artists: Maria Laura Sanapo and Jason Lewis, and Adriana Melo. With the body count growing, Callum and Aisha’s road trip take them to the location on the cipher. They have a plan, but Callum’s health may sideline him, leaving it up to Aisha to put the pieces together and get the evidence to arrest the Crypto-Killer. Meanwhile, Callum’s evidence tampering in the original case come to bite those still in his FBI unit back home. And Brian has a fan who’s interested in more than just his paintings. The past and present are resolved in the conclusion of Twelve Devils Dancing. Dave Acosta (Pencils) and Andrew Covalt (Colors) bring this book to life from Action Lab Danger Zone. Cover artist: Natasha Alterici, Interior cover artists: Michael Montenat and Kevin Maher. For years, a serial killer dubbed The Crypto-Killer mutilated women and left cryptic ciphers on their bodies. FBI Special Agent Callum Cooper was the one to solve the ciphers and catch the killer... Or did he? Now retired from the FBI because of a fatal diagnosis, the real killer emerges with a new mystery for Callum, and his past comes back to haunt him, torturing him in his last days. With the help of Aisha Miller, a bio-tech genius college student, Callum and Aisha are tasked with confronting this agent's past mistakes, as they both seek redemption before it's too late. Cover by the legendary Bill Sienkiewicz. Vertigo Quarterly SFX #1: Pop! This anthology brings together all kinds of comic talent to showcase the importance of onomatopoeia in comics. “Pop Goes the World” story written by Erica Schultz with art by Sara Richard (My Little Pony: Friendship is Magic). This anthology shows the talents of the graduate writers from the inaugural DC Talent Development workshop. With talent from all over the comics spectrum, this book boasts a Hawkgirl story written by Erica Schultz with art by three time Eisner Award Winner Sonny Liew (Dr. Fate). All items shipped via USPS first class mail - US customers only, please contact us for international shipping options.